Dance may have been the very first means of communication. It can be traced that dance as an act started from the moment it was harnessed to a rhythm, probably the stamping of the feet and clapping of the hands. Throughout recorded history, there is static evidence of dancing men in painting, drawings and sculptures. Dance of the earliest times differ from those of the present times. There are primitive and nonprimitive dances. Indians dance to give thanks for a harvest, the Mexicans to celebrate a religious festival, teenagers dance at parties, both young and old because it is pleasurable to express joy through bodily movements or body language. In the East as well as in the West, dancing was developed as a social grace. Various kinds of religious social and theatrical dances evolved slowly in the dances today. The art of Indonesia is permeated by a strong Hindu-Buddhist tradition due to the migration of Indian culture. This is evident especially in their architecture, theater, and dance. The influence of the great Indian epics, the Ramayana and the Mahabharata is seen in the Wayang performances. The most popular of these is the Wayang Kulit, a type of shadow play which is believed to have been generally known as early as 1,000 A.D. Although the Indonesians have, on the whole, embraced the Islam religion, they still pay tribute to the ancient Hindu gods of the epics in the Wayang. The Wayang is performed to mark important occasions, such as a birth, a wedding, or a circumcision. It begins in the evening and lasts through the night until dawn. The puppets are manipulated by the dalang, an important priestly figure who interprets the story and may spice it with humorous and satirical contemporary elements. The entire narration is accompanied by the gamelan orchestra, which is also found in Southern Philippines. 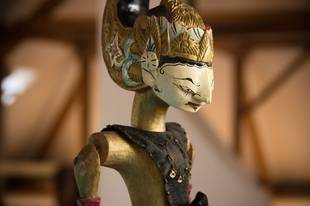 The puppets of the Wayang Kulit are of leather with ornamental perforations and designs in gold and other colors. They are executed in the Wayang style, which is stylized and caricatural, the figures being angular, thin in profile with broad shoulders and elaborate headdresses. Another important feature of the Wayang Kulit is the Gunungan, a mythical wonder mountain bearing a tree with numerous branches, flowers, fruits, singing birds, and animals. The Wayang Kulit is not only an entertaining performance; it is also an important ritualistic tradition in the life of the people. In Bali, religion is intertwined with dance, of which the central figures are Rangda, the witch of evils, and Barong, the good spirit. Both are portrayed by means of colorful and highly imaginative masks. In Kechakor the Monkey Dance, fifty men chant and sway, shaking their fingers around a bonfire, thus recalling the exploits of the monkey Hanumanin the Ramayana, while passages are recited from the epic. All throughout Indonesia, there is an interesting dance-fight called the Penchak. This is similar to the martial dances of our Muslim brothers in southern Philippines. Such similarities between Indonesia and Philippine indigenous culture show our common ethnic origins. 1. Draw or sketch Wayang Kulit in your cardboard or illustration board. 2. Cut your finish Wayang Kulit drawing. 3. Paste or glue gun the different colored beads, sequins or colored stones to dress-up Wayabg Kulit. Make your desired design. 4. Paste the bamboo stick at the back of your finish craft. 5. Show it to your classmate and submit it to your art teacher.